Are you trying to find a good driving instructor but don't know where to start? Follow these 10 Top Tips and you'll soon be on the road and learning with a great instructor - one who is fully qualified and who cares about your progress. 1) If possible, choose an instructor based on personal recommendation. People who have had a good experience with a driving instructor will always be happy to recommend that instructor to their friends. So if you know somebody who has recently learned to drive, or is still having lessons, ask them what they think about their instructor. Good instructors are always busy because they work mainly on recommendation. They probably don't advertise in the paper, or drive around in a car that looks like a mobile advertising hoarding, because they don't have to. All their work comes from word of mouth, and ideally these are the type of instructors you should aim to seek out. They could also end up costing you less, even if their hourly rate seems a little higher than average, because good instructors will get you up to test standard quicker than less experienced ones. So you could actually save money and pass your test quicker than if you just went for the cheapest hourly rate. As with most things in life, you usually get what you pay for! 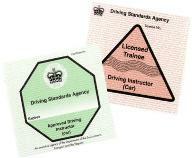 2) Check whether the instructor has a pink or green licence. There are two types of instructor licence - pink and green. A pink one means the instructor is a trainee instructor. He is not yet fully qualified and is practicing (and that means on you) prior to taking his final instructor test (called the Instruction Ability Test). It is only some of the larger driving schools that put these part-qualified instructors out on the road, allowing them to teach while they practice for their final test. In fact almost half the instructors in one the largest schools are not fully qualified. However these driving schools won't tell you this, nor will they ask you if you are happy to be taught by somebody part-qualified. They will still charge you the same rate as for a fully qualified, experienced instructor, though! A green licence means the instructor is fully qualified (known as an Approved Driving Instructor, or ADI). All instructors must display their instructor licence in the front screen of the car, so they are in fact very easy to check out. So when you call a potential instructor about lessons the question to ask them is, "Are you a fully qualified ADI?" or, "What colour licence do you have?" 3) Look for an instructor who is friendly and approachable! It may sound obvious, but plenty of people put up with grumpy or impatient instructors. So on your first contact, consider if the instructor sounds friendly and approachable. Try to find out if he ever gets impatient with his students. If he doesn't sound very friendly and helpful when you are first making enquiries, it's unlikely to get any better. Do you think he will explain things fully and well, and make you feel comfortable asking questions? As far as being impatient goes, there is no excuse or reason for an instructor to show impatience. A good instructor should be understanding and remember how difficult it is to learn to drive; some students just find learning to drive more challenging than others. Unfortunately, there are many who don't consider this, as they are too busy worrying about their car - some instructors get very protective about their car and can over-react when something minor happens. 4) Make sure your instructor will give you one-to-one lessons. Some instructors carry out 'piggy-backing'. (Yes, we know this sounds weird but bear with us). This is where, while on your lesson, you pick up the instructor's next student whose lesson is after yours so the other student is on the back seat of the car watching and waiting to take over immediately you finish. This means your instructor can start his next lesson immediately yours finishes. The reason for this is to save the instructor's time driving from one student to the next. However, your lessons are your time and should not be shared with anyone else, unless it is something you specifically request. It is distracting to have another student in the car, won't be of any benefit to either you or the other student, and only causes problems. It is also frowned upon by the Driving Standards Agency (DSA). 'Piggy-backing' is purely a result of the instructor putting his own interests before those of his students. 5) Look for an instructor who will give you positive feedback. Okay, so it's difficult to know beforehand whether an instructor is the positive type, eg "that was a really great left reverse!" or the negative type, eg "don't do it like that!" But if you find after your first lesson or two that your instructor is giving you a lot of stick and not many carrots, then don't feel you have to persevere with them - just try somebody else. And keep trying instructors until you find the right one. It's as important to know when you have done something well whilst driving as it is to be told when you have done something wrong. After all nobody likes to hear only negative comments! To be praised for doing something well will build your confidence, and you will then know exactly what you should be doing, and how to do it right next time. So make sure your instructor is positive and enthusiastic during lessons. You'll enjoy yourself more and learn more quickly. 6) Check your instructor will use proper lesson plans. Ask if the instructor has (and will show you on your first lesson) a list of all the subject areas you will need to cover before you will be ready to take your test. Also, ask how many subjects there are. 7) Don’t feel pushed by an instructor into paying for a block of lessons in advance (block-booking). No instructor should push you into booking and paying for lessons in advance. While it's okay for the instructor to bring to your attention that you will need say, another 15 hours of tuition, and then explain that you could save some money by block-booking your lessons, after that it should be up to you - don't put up with any hard sell tactics! If you do decide to block-book your lessons, then don’t feel obliged to take all of them just because you have pre-paid. You are entitled to your money back for any lessons that you haven't taken, but some instructors give the impression that the money for pre-paid lessons is non-returnable. 8) Ask how long your lessons will be. Try asking where the instructor takes his students to practice hill starts and clutch control, roundabouts or perhaps pedestrian crossings, and his answers will probably be quite revealing! Unfortunately, many instructors will only do one hour lessons and this often makes it impossible to drive to different places and allow time for sufficient practice. Your instructor should take you to different places/towns to practice particular topics, depending on the lesson. If there is not sufficient time in an hour (and there seldom is), the instructor should explain during your initial enquiries the benefits of doing some longer lessons which would allow time to go to other places. If your instructor will do two hour lessons then it is usually possible to go wherever is appropriate for intense practice on the subject matter that day. This also gives the added bonus of giving you new places to drive, which is more enjoyable and good driving experience. 9) Check that your instructor always starts and finishes on time. Also, he should never suggest stopping for a coffee, cigarette or loo break on a lesson. Your instructor has an obligation to turn up for your lesson on time and give you the full time booked working on your driving (or help with theory if that has been agreed). There is no excuse for stopping for a drink, sticky bun or a loo break – he should do that in his own time before or after your lesson. 10) Find out if your instructor/driving school really cares about you. If your driving school doesn't have a system in place for collecting feedback from students, they are effectively saying that they don’t care what you think about them. Even the large driving schools are not concerned about customer satisfaction, as their main objective is to get as many instructors as possible out on the road (even unqualified ones - see our Top Tip no 2). If a driving school doesn’t have a system in place for getting feedback from their students, how can they make improvements? Answer – they can’t. A good driving school/instructor realises that your opinion is their future – if you are not happy with your lessons you won’t recommend your instructor to others. So they should talk to you from time to time with the aim of continually improving their service. So now you know what questions to ask when you call a driving school, and what the answers to those questions should be. You've got a little bit of work to do, but the effort you put in to finding a great instructor will be worth it in the long run. Do you have any questions? Just ask any instructor - they should be more than happy to fully answer all of your queries. Remember there's no such thing as a stupid question, so just ask! Jan Hunter is a co-founder of Pelican School of Motoring, an ADI (Approved Driving Instructor), and has helped teach over 800 people to drive since 1992. "I was one of the first people to pass the new driving test." "When I was looking for a driving school I wanted someone who understood my needs. 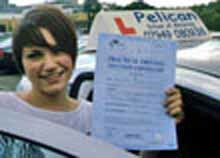 I had been starting and stopping lessons for over 10 years and with the extension of my family (new baby) it was a real 'must' for me to get my licence. When I spoke to Jan she was very understanding, took into account my driving level and didn't treat me as someone who has never been behind the wheel. On my driving assesment with Steve he was very encouraging and made me believe I should pass my test with ease. During my two hour lessons Steve was a good companion and he is a thouroughly nice chap. I think part of my success was down to Steve's belief in my driving and the encouragement he gave. Four minor faults later and I was one of the first people to pass the new driving test. I wish to thank Jan and Steve for all their help."